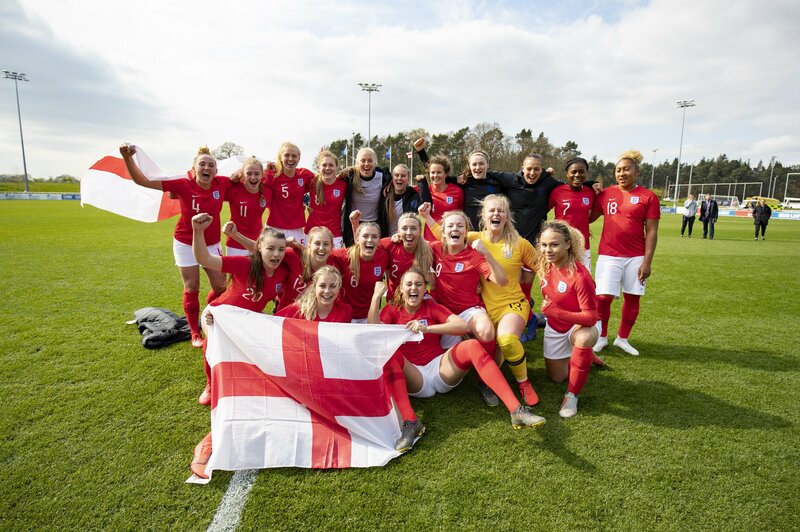 Italy 0-2 England, European Women’s Under-19 Championship, Elite Round, St George’s Park, 9 May 2019. 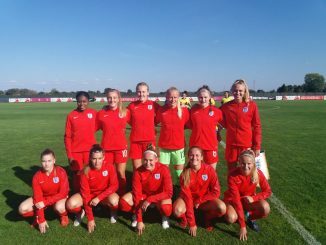 England clinched their place in the Under-19 European Championship finals with a comfortable win against nine-player opponents, REPORTS TONY LEIGHTON. Early goals by strikers Jess Naz and Lauren Hemp set the young Lionesses on the way to completing a clean sweep of Elite Round victories. Italy were reduced to 10 players seconds before half-time, when captain Angelica Soffia was sent off after collecting a second yellow card. And 12 minutes into the second half they also lost defender Vanessa Panzeri, dismissed for dissent after being yellow-carded for a foul on Naz. 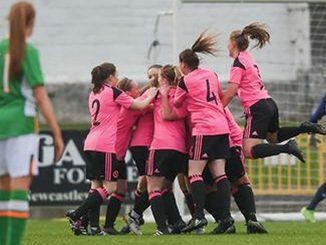 England were unable to add to their lead, but they ensured their appearance at July’s finals in Scotland with no real problems. After previously beating Turkey 7-0 and Sweden 4-0 it meant Rehanne Skinner’s team had ended the round with an impressive 13-0 aggregate score. Coach Skinner said: “I’m ecstatic, excited, this is a great group of players to work with and there’s been a lot of progress over the course of the season. “Before today’s game the players 100 per cent had a real clear intent what they wanted out of it, and they’ll be exactly the same going into the summer. “The big thing was that we didn’t just want to perform well, we wanted to send a message for what that’s going to look like going into the finals. “We were quick out of the starting blocks again today and that made it difficult for Italy to settle – the two early goals set the tone for us. England started at express pace, just as they had against Turkey and Sweden, Tottenham Hotspur’s Naz hitting the net after just three minutes. Six minutes later Naz played a neat one-two with Hemp for the Manchester City player to shoot home. Though they continued to dominate proceedings, England lost their early zip as half-time approached. And Italy, despite starting the second half a player short, almost pulled a goal back as Angela Caloia forced goalkeeper Hannah Hampton into a fine save. The Italians’ hopes of an against-the-odds fight back were, however, reduced further when Panzeri saw red. But England, with five substitutions during the second half, failed to gain their early momentum and had to settle for a two-goal victory. Now they can look forward to the Euro Championship finals, where success would earn them a place at the Under-20 World Cup finals. 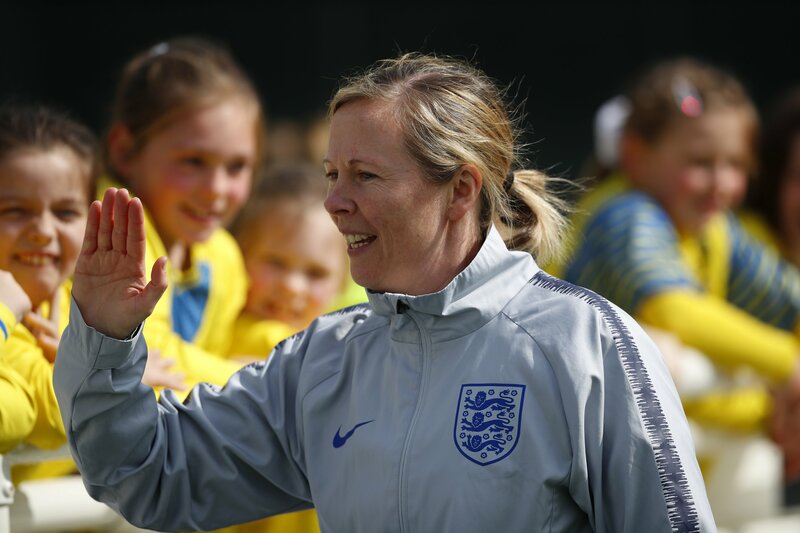 Skinner added: “As England teams we’re looking to be regular contenders in World Cup finals and Euro finals, that’s something we’re striving towards. England (4-2-3-1): Hampton (Birmingham City); Neville (Millwall Lionesses) (sub Smith (University of Oklahoma) HT), Morgan (Manchester City), Pattinson (Bristol City); Palmer (Manchester United), Rodgers (Liverpool) (sub James (Manchester United) 77); Hemp (Manchester City), Fitzgerald (Millwall Lionesses) (sub Hutton (Aston Villa) 84; Rutherford (Bristol City) (sub Syme (Yeovil Town) 66); Naz (Tottenham Hotspur) (sub Salmon (Sheffield United, on loan from Manchester United) 66). Italy (4-4-2): Aprile; Orsi, Ripamonti (Boglioni 23), Panzeri, Soffia; Baldi (Puglisi HT), Tomaselli (Imprezzabile 66), Colombo, Caloia; Longo, Greggi.